im picking up my new A3 saloon sline on Wednesday. 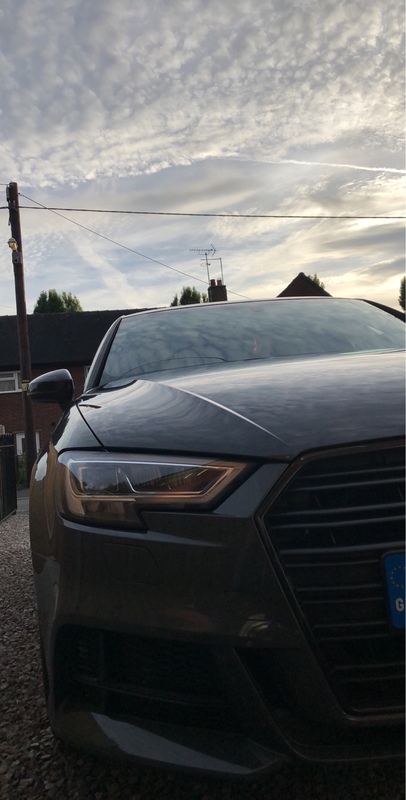 suddenly I’m having regrets on the colour, I’ve chosen Nano grey, after seeing one pass by me a while ago I instantly loved it, reading people’s comments on here it doesn’t seem that popular and there seems to be issues with stone chips being very noticeable, also in certain light conditions in various pictures I’ve seen online it doesn’t look how I remember seeing it. Your thoughts please? jimojameso, jassyo06 and Kayobong like this. Whenever I see a Nano I love it, although I love most of the greys Audi do. However Nano kinda looks like Nardo, just a bit darker which is really nice imo. Whenever I see a Nano I love it, although I love most of the greys Audi do. However Nano kinda looks like Nardo which is really nice imo. have you gone for black edition? BE compliments nano. Yeah, the black styling pack definitely compliments it. Nano has been my favourite colour for the past couple of years and always regret not getting the wifes tt in it. Made up for it today though..
Leevr, SPIKE_S3, daytonamart and 4 others like this. Where did you get the black rings from are they easy to fit? Jimbob76, Chris43 and 1future like this. I've not decided yet... I really liked it the first time, but maybe it was because it was the first time lol. Jimbob76 and jassyo06 like this. Its a year old and so far no stone chips, why they insist in using white undercoat, something that really makes a chip stand out is beyond me. That looks totally different again in the light but looks really nice. Not a fan of greys but I do like that especially when it’s not in direct sunlight, front half in the first pic. jassyo06, BarryG79, AlS3BE and 1 other person like this. I think colour is so based on peoples opinion that you will never please everyone. I like it but I think its a statement and I would be worried I would get board of it after a while which wouldn't happen with a generic metallic black/white/grey. If you are thinking about re-sale a dealer told me the top best selling colours for re-sale are: Mythos black / Glacia White and Deytona Grey (in no particular order). However, who buys a car for re-sale?! Buy a car because you like it, and if you do then your on to a winner mate There will be haters and lover no matter that you choose. Flying Scotsman, AlS3BE, oli356 and 2 others like this. Couldn't agree more Jassy, like the MK4 and MK5 R32 had Deep Blue Pearl specific to them. SPIKE_S3 and jassyo06 like this. Jcbmally and SPIKE_S3 like this. First 68 REG I've seen on here, looks lovely as I knew it would! Enjoy! FL A3 Saloon1.4TFSi COD,S-Line, Privacy Glass, Floret, Panny. Bells and Tom.H like this. nano is a great colour, especially with black edition. I was in a real dilemma...Nano or Daytona. In the end I opted for Daytona on a Black Edition at the last minute....I'm still trying to convince myself it was the right choice but every time fine I see Nano I have a real pang of regret. I know i would do the same if i had chosen Nano over Daytona lol.... Enjoy your car, its stunning! Congrats, and Nano is a great colour. Enjoy. What a colour DBP is . That and the raspy 6 cylinder engine is what made us get a mkV back in the day. The wife still goes on about that car being her favourite. Nano is really nice, but its main problem is that Daytona exists IMO. Really struggled to choose between Nano and Daytona Grey.. In the end up i went for Daytona. Nano is the nuts though! 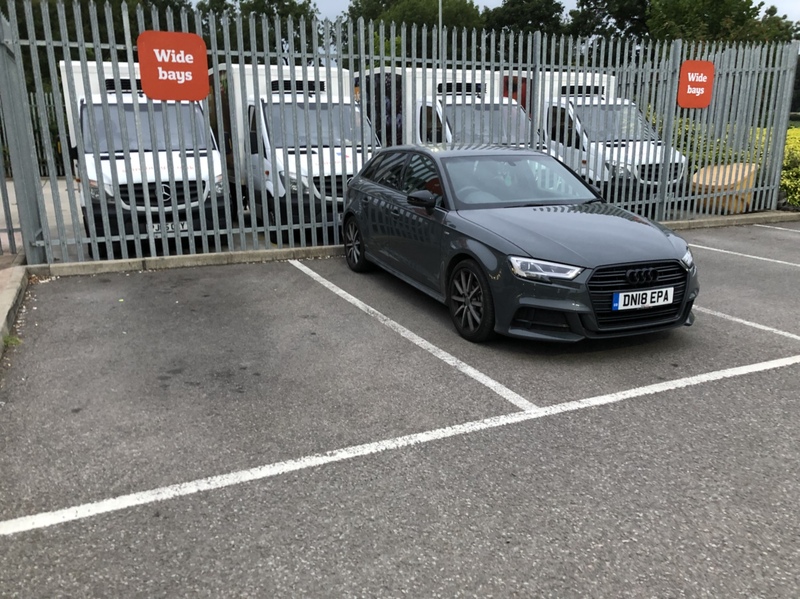 im picking up my new A3 saloon sline on Wednesday. suddenly I’m having regrets on the colour, Your thoughts please? in the end, the only opinion that matters is yours, I like the colour, but not if I'm paying for it, actually I much prefer the Floret Silver to any of the greys. Agree with Jassyo06 about the Misano Red and Sepang Blue, the blue my absolute favourite.